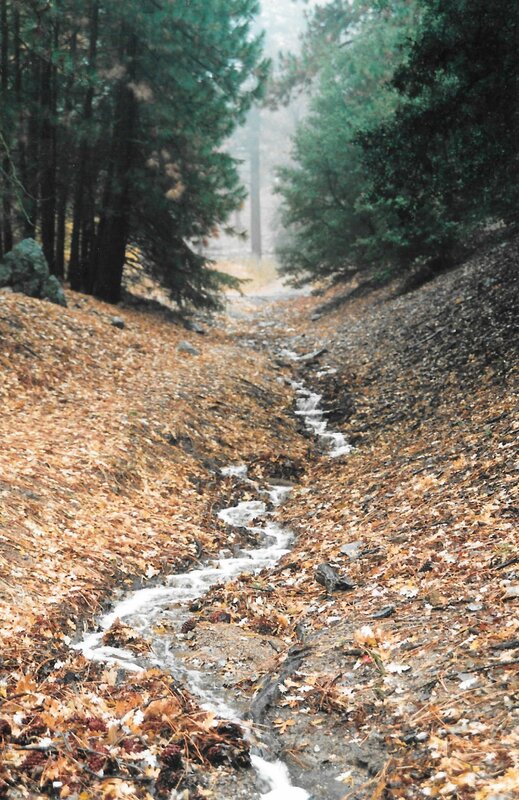 The first rains begin to awaken long-dormant little water courses like this one in the Tehachapi Mountains. The water is initially mocha-colored as it carries six months' worth of dust and debris. In the days following rain, the water will slow down and become more clear. Evergreen foliage like these Gray Pine needles are cleaned and refreshed when our annual rains arrive to end a yearly six-month (or longer) drought. The Tehachapi Mountains finally got a good soaking of rain as a result of several days of mostly light rainfall. Our annual summer dry season has ended. The storms came as a welcome relief to California after a historically bad fire season. Rains after such a prolonged dry period are a delight. They settle the dust, clean the air, and just in general provide a much-needed cleansing. The first significant rainfall of our wet season begins to have an effect as soon as the earliest raindrops fall on the tallest trees. Faded autumn leaves, drained of chlorophyll and spent after long months of producing food for the tree, are carried downward by the weight of the water. The first heavy rain often carpets the ground with discarded leaves. Healthy foliage remains on evergreen trees and shrubs and is renewed by the moisture: soaking rain cleans six months' worth of dust off the leaves and improves their ability to photosynthesize. Once they reach the earth, the initial raindrops are sucked up by the thirsty soil. In the face of continuing rain, however, more moisture will fall than can be readily absorbed. This happens most quickly in the steepest areas, of course, and runoff begins in the mountains. Utterly dry creek beds will suddenly have rivulets trickling through them. Flowing water from the first rains is inevitably frothy as fine dust, pollutants and other particulate matter are whipped into foam and carried along on the surface of the water. 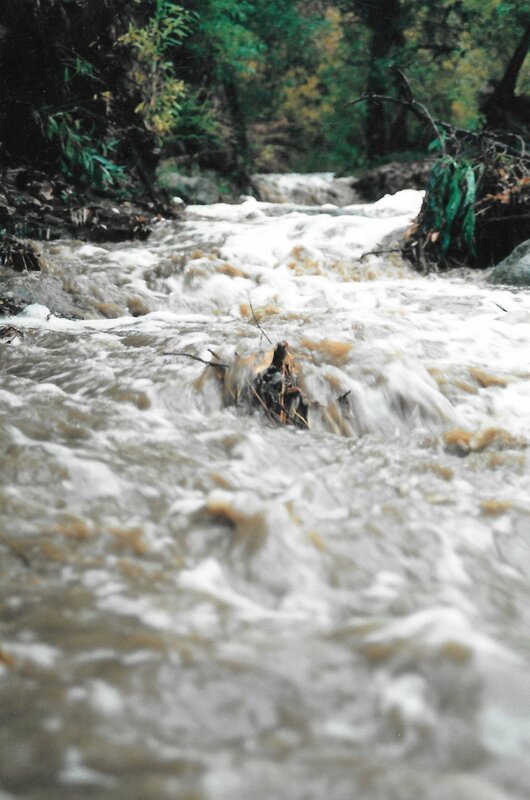 As rain continues, creeks swell and pick up speed, carrying more debris downstream and ensuring that the tumbling waters will remain as brown and foamy as hot chocolate with whipped cream. 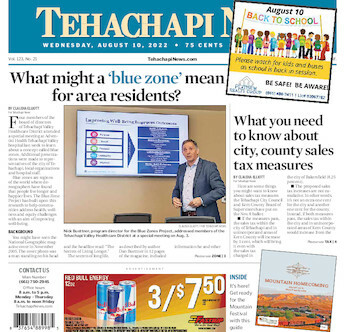 Tehachapi Creek, Brite Creek, Oak Creek, Chanac Creek, Sycamore Creek. . . these seasonal waterways spring to life with heavy rains. When rains keep falling, pools and puddles begin to form in lowlying areas. Our historic old roads, born of necessity without the sanction of road engineers, start to flood as standing water spreads onto the roadways. Banducci Road, Highline Road, Old Town Road, Cummings Valley Road and the other original routes are narrowed by temporary roadside pools and puddles. Nearly all birds and animals take shelter during storms. For many of them, it is their first rain — most of this year's offspring were born during the dry season. One exception is the Western Toad (Bufo boreus), which appears after or even during a heavy rainfall. They depend on our infrequent rains to transform the landscape into habitat that is more conducive to amphibians like them. Unfortunately, some toads take to asphalt roads, and then fall prey to cars. When the rain tapers off and you can be outside without getting soaked, you can almost sense the plant kingdom rejoicing, for the now-purified air is rich with the aroma of freshly laundered and watered Tehachapi flora. The first sunny days will then germinate millions of seeds that have been waiting in the dry soil, and faint tinges of green will appear on the hillsides. These patches of green will deepen and expand if the rains keep coming, erupting into tall grass and wildflowers in spring if the moisture continues. . .
And of course, we all hope it does.